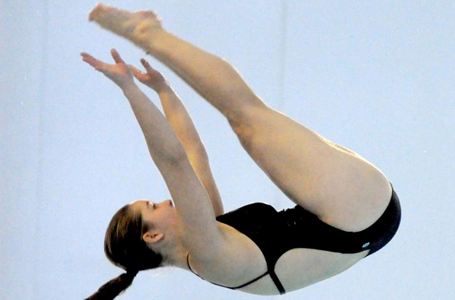 Junior Sarah Sheridan placed third in 1-meter diving at the NCAA Division III Championships on Friday in Shenandoah, Texas, for the top finish in the event by a Hope diver - female or male. The All-American Sheridan surpassed Kari Jackson's fifth-place performance from 2000 and 1999. Also on Friday, sophomore Molly Meyer finished 25th in the 100 backstroke. Meyer will compete in the 200 backstroke today. Preliminaries begin at 10 a.m. Central, with finals at 6 p.m. CDT. The Canadian Guitar Quartet will perform at Hope College on Tuesday, March 31, at 7:30 p.m. in the Knickerbocker Theatre in downtown Holland. Testimonials by outstanding senior students reflecting on their experiences at Hope College will be featured during the Hope College Senior Recognition and Women of Color Celebration on Wednesday, April 8, at 5:30 p.m. in the Maas Center auditorium.